Being a unique city in terms of history and geography, Istanbul deserved a unique marathon. Despite the financial and logistical problems, an initial project was set up for the Eurasia Marathon. A city so unique in its history and geography such as Istanbul, well deserves unique events and projects just like the Euroasia marathon, the one and only experience of running from Asia to Europe, through the Bosphorus bridge, with a breath taking view of the sea and the city. 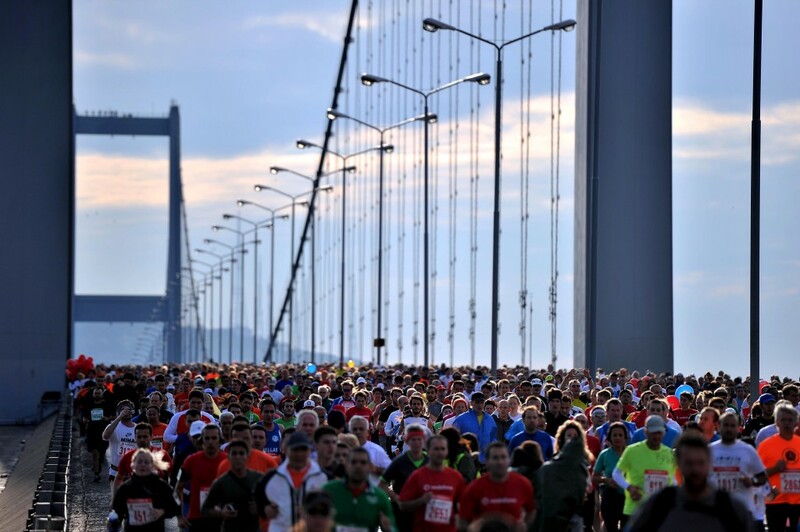 35th Intercontinental İstanbul Eurasia Marathon was held on 17th November 2013 with 3 main categories – Marathon (42 km), 15km, 8km races – and a Fun Run. Abraham Kiprotich and Rebecca Kangogo Chesir both from Kenya are the two winning athletes of the marathon. Elvan Abeylegesse, came 2nd. Winner athletes received their prizes in the ceremony held in Istanbul Congress Center on Sunday evening. The biggest prize for the top ranking athletes was 50.000 TL, second ones got 25.000 TL and third athletes received 15.000 TL. The Eurasia Marathon went from proposal to reality in 1978. The officials were informed that a group of German tourists who ran marathons in the countries they visited, were planning a trip to Istanbul the following year. This was the impetus needed to finally realize the Eurasia Marathon project. Preparations were completed and the marathon racers, 34 of them from the 74 person tourist group, gathered at a point 700 meters behind the Bosphorous Bridge to start the race on that historical day. The first winner of Eurasia Marathon was Hasan Saylan, a Turkish athlete from the city of Zonguldak, with a time of 2:35:39.